When you feel like enjoying a bowl of delicious comfort food, nothing really beats noodles. 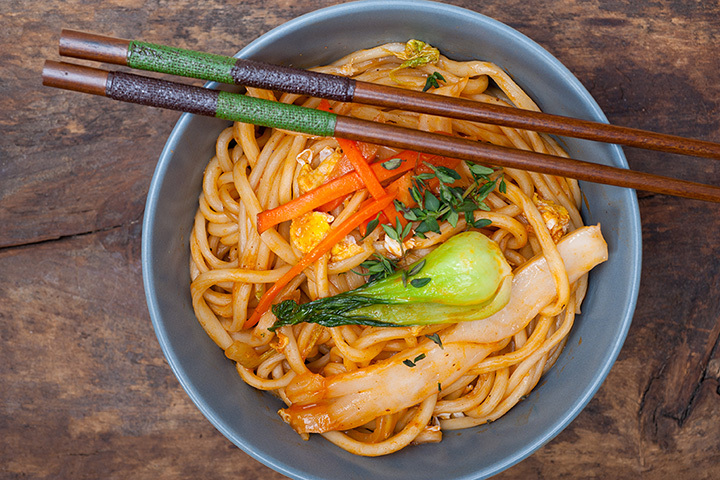 Whether they be udon noodles, lo mein, ramen, or any other yummy variety, when you’re craving them, nothing else will do. Some of the best places to find noodles are right here in Nebraska, and here are 10 of our favorites. Sushi Japan has been serving the Omaha area delicious Japanese fare for over 15 years, where the lunches are casual, the dinners intimate and where they even specialize in traditional Yakiniku, also known as Japanese barbeque. However, it’s the noodles that keep people coming back for more here. Traditional ramen is a particular favorite, as is the Nabeyaki Udon, which features floured noodles in a hot pot with chicken, shrimp tempura, egg, wakame, shiitake mushrooms and scallions. Suwannee Thai Cuisine has been family owned and operated in the Kearney area since mid-2010. The goal is to let residents experience traditional Thai cuisine and culture, which features everything from sweet southern style to the northern inspired and oh so deliciously spicy Drunken Noodles! Stir-fried flat rice noodles with egg, garlic, onion, tomato and bell peppers are the main ingredients in this spicy yet scrumptious dish. With four locations throughout Nebraska, Blue Sushi Sake Grill has become a popular new favorite among noodle lovers. The Thai Hippie is a popular dish, as are the Hotel Cali and Crunchy L.A. No matter which dish you choose from the menu, you’re guaranteed something that is flavorful and absolutely amazing! Umami is consistently rated as one of the top sushi destinations in America, and it’s easy to see, or rather taste, why after you’ve sampled some of Chef Keen Zheng’s mouth-watering creations. Try a bowl of the Yaki Udon or Soba noodles, served with vegetables and your choice of protein, or the Curry Udon Noodles, which is the perfect choice if you like your noodles extra spicy and full of flavor! Nice Noodles Omaha really is Omaha’s nicest noodle joint! Healthy, nutritious, yummy, budget friendly, local and conscious are all words that customers use to describe this eclectic place! Here you can create your own dish and choose from a large variety of ingredients, or choose from one of their delectable readymade choices, such as the Pad Thai noodles and curry, or the Wheat noodles and Chinese spicy sauce! Visitors and locals alike cannot get enough of the Tempura Japanese Restaurant. Here you’ll find modern interpretations of classic dishes and only the freshest, highest quality ingredients. Their Yaki Udon and Udon Noodle Soups are the most popular choices. The Chicken Udon soup features flour noodles in a yummy, made from scratch chicken broth. The Vegetable Yaki Udon is great for the vegetarians or vegans. Each dish comes with a side salad and the portions provide enough leftovers to last through the weekend! Have mercy as Uncle Jesse would say. The Mercy Thai Restaurant takes customers on a glorious and delicious experience with each of their unique traditional Thai dishes, especially their noodle dishes. Try a bowl of traditional Noodle soup or Boat Noodle soup, or the Rad Nad Mee Krop soup, all made with rice noodles and featuring an assortment of vegetables and proteins. Amazing service and even more amazing food is what you’ll find here at the small, family owned and operated Vietnamese Restaurant in La Vista, Nebraska. Everything is so delicious that it’s hard to choose just one dish, so it’s recommended you try something new with each visit! The Combo Street Noodles, Hot and Spicy ‘Hue’ Noodle Soup, and meatball Pho are among the fan favorites! The goal of Salween Thai Restaurant is to provide their customers with the freshest ingredients and the most authentic Thai cuisine. Spice levels range from 1 all the way to 10 depending on your preference, and tolerance. Fan favorites include the Pad See Yew, Rad Nat Combo, and the Drunken Noodle Combo. This highly-praised restaurant right in Lincoln has a menu full of all sorts of spectacular flavor combinations. Once you try one of the many noodle dishes, you will understand why people can't seem to get enough. From Pad Thai to Pad See-ew, they put their own spin on the classics. Their Khao Soi includes a base of rice noodles with cilantro, shallot, and pickled collards in a delicious yellow curry sauce topped with coconut cream, crispy noodles, and house-smoked chili oil. The options are very well cultivated, so get ready to take your taste-buds on a marvelous adventure!